Charming and sweet in the Felicia first-walkers from Sam Edelman Kids! 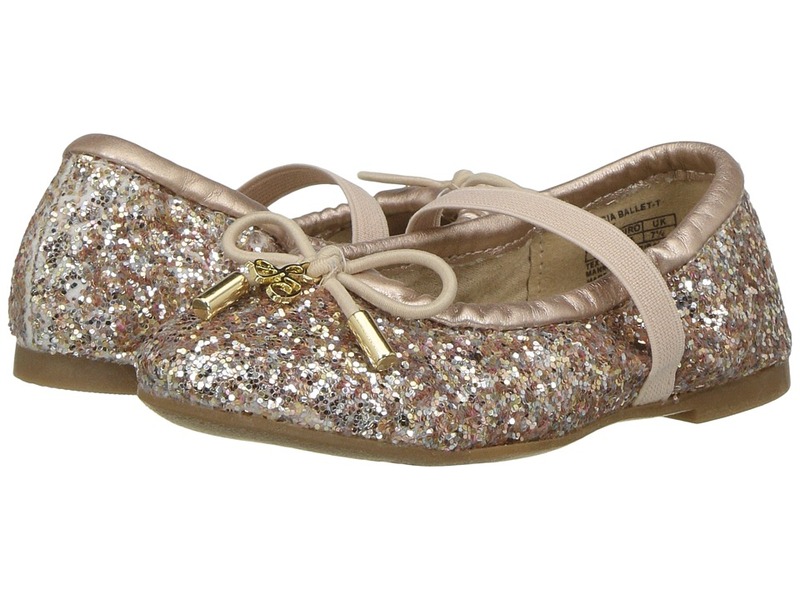 Ballet flat in a manmade upper features glitter throughout. Signature logo charm. Elastic band for easy wear. Slip-on design. Manmade lining and footbed for comfort. Manmade outsole. Imported. Measurements: Weight: 2 oz Product measurements were taken using size 8 Toddler, width M. Please note that measurements may vary by size. Weight of footwear is based on a single item, not a pair. Something seductive this way comes. 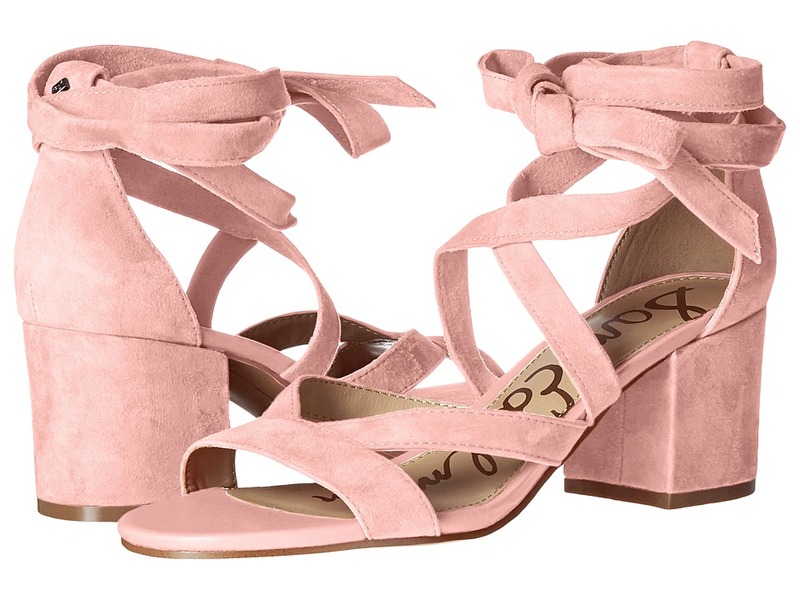 Step into sultry with the alluring Sam Edelman Alba sandal. Suede upper. Ankle-wrap with back-zip closure. Man-made lining. Lightly cushioned insole. Wrapped stiletto heel. Man-made outsole. Imported. Measurements: Heel Height: 4 in Weight: 10 oz Platform Height: 1 4 in Product measurements were taken using size 10, width M. Please note that measurements may vary by size. Weight of footwear is based on a single item, not a pair. 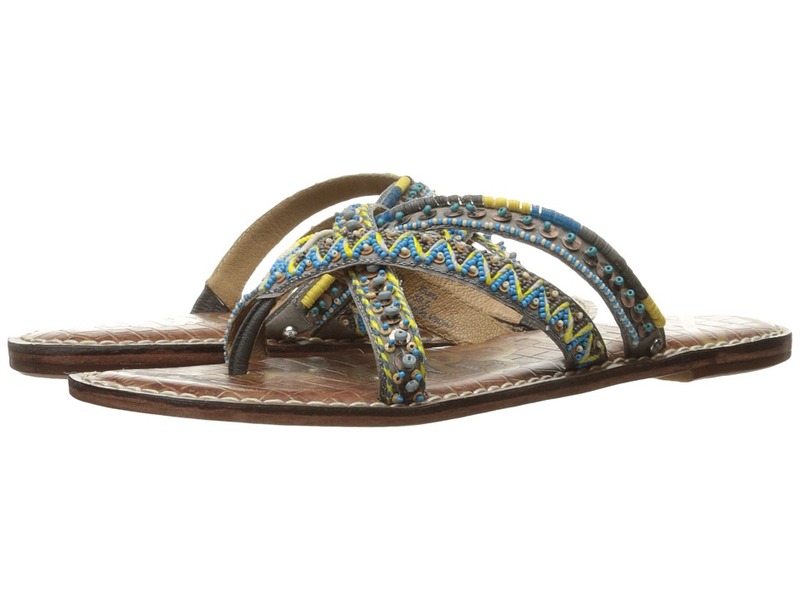 Invigorate your summer essentials collection with the festival friendly Anella sandal. Man-made upper with beaded textile embellishment. Slip-on design. Thong-style silhouette. Leather lining. Lightly padded footbed. Leather sole. Imported. Measurements: Heel Height: 1 4 in Weight: 5 oz Product measurements were taken using size 7, width M. Please note that measurements may vary by size. Weight of footwear is based on a single item, not a pair. Bernice is always sassy and sometimes sensible. She says yes to glamour and frowns on frumpy. 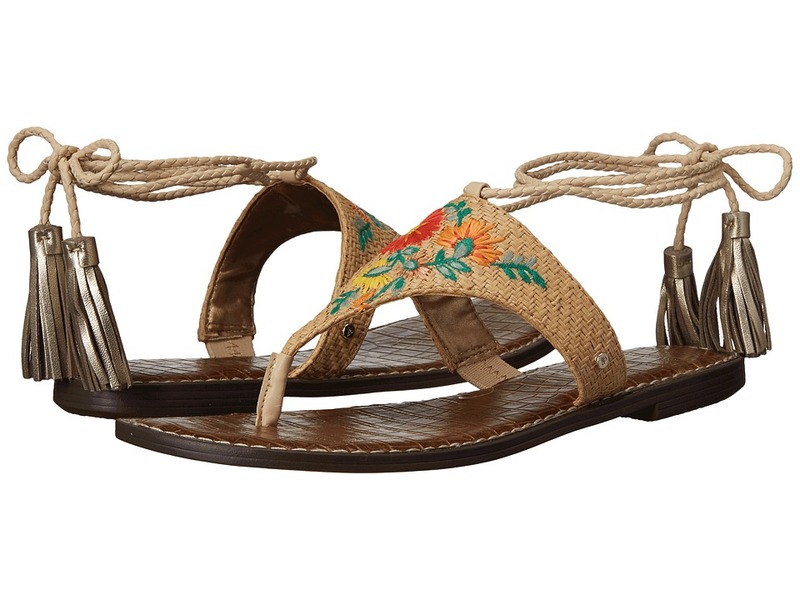 Tap into your inner Bernice with her chic slide from Sam Edelman. Premium leather upper. Slip-on design. Thong-styling with softly-squared toe silhouette. Man-made lining. Signature logo detail at insole. Man-made sole. Imported. Measurements: Heel Height: 3 4 in Weight: 5 oz Product measurements were taken using size 8, width M. Please note that measurements may vary by size. Weight of footwear is based on a single item, not a pair. Something seductive this way comes. Step into sultry with the divine Sam Edelman Davina sandal. Suede upper. Ankle-wrap, tie closure. Man-made lining. Lightly cushioned insole. Low wrapped heel. Man-made outsole. Imported. Measurements: Heel Height: 3 4 in Weight: 6 oz Product measurements were taken using size 8.5, width M. Please note that measurements may vary by size. Weight of footwear is based on a single item, not a pair. 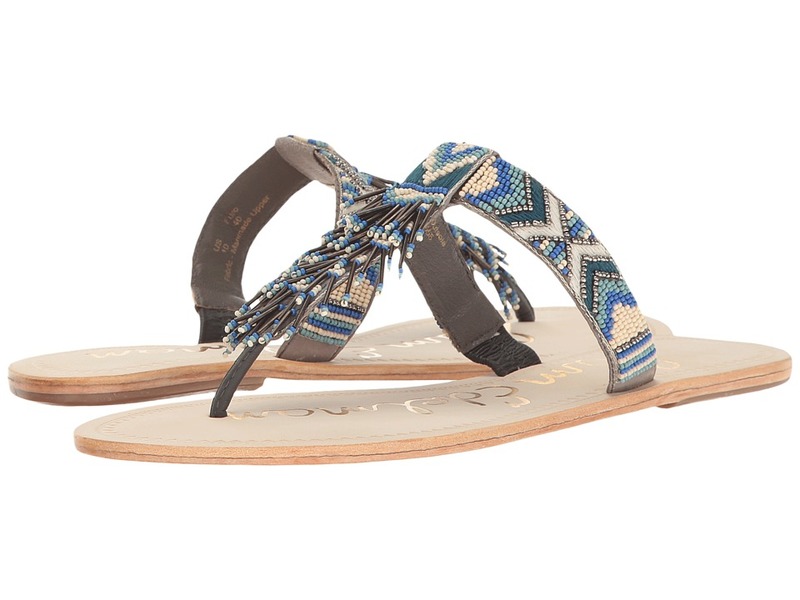 Be admired for your adorably-chic style in the Sam Edelman Felicia flat! Textile upper with embroidery embellishment. Slip-on design. Round toe. Signature logo detail. Bow accent at toe. Leather lining. Padded footbed. Mini stacked heel. Leather sole. Imported. Measurements: Heel Height: 1 4 in Weight: 4 oz Product measurements were taken using size 7.5, width M. Please note that measurements may vary by size. Weight of footwear is based on a single item, not a pair. 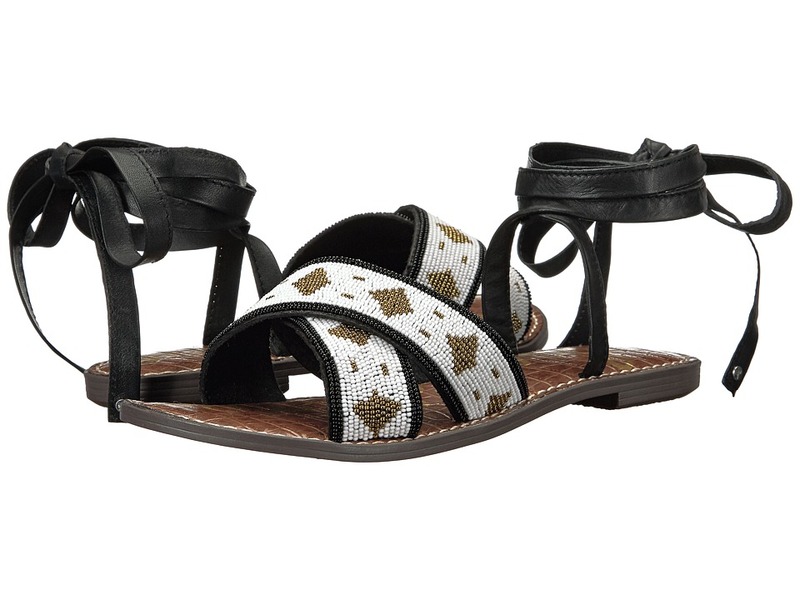 Bridge the style gap this season with these fun and flirty Sam Edelman Gates sandals. Leather and synthetic upper. Adjustable buckle closure at ankle strap. Festive, fringed T-strap. Synthetic lining and cushioned footbed. Small, stacked heel. Synthetic sole. Imported. Measurements: Heel Height: 1 2 in Weight: 5 oz Platform Height: 1 4 in Product measurements were taken using size 8.5, width M. Please note that measurements may vary by size. Weight of footwear is based on a single item, not a pair. Give your sassy side a seasonal outlet. 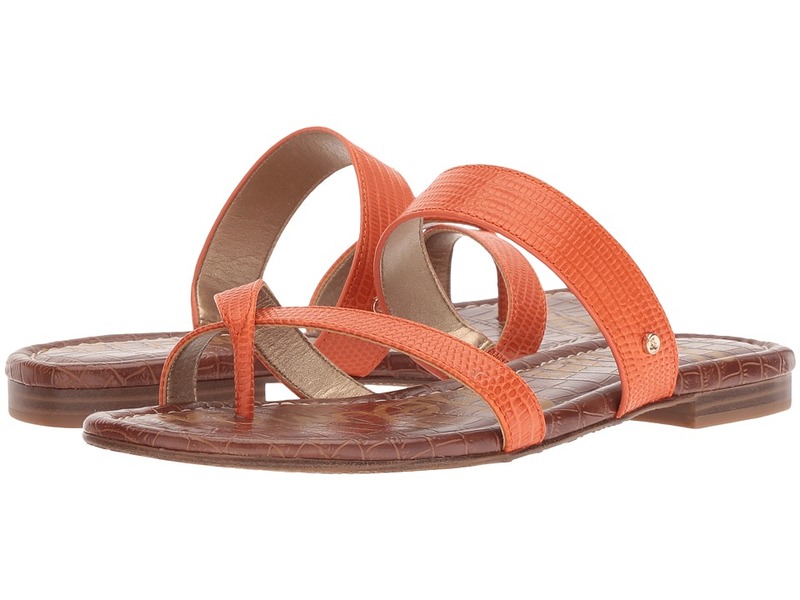 Pander to sunny days with the breezy Sam Edelman Geri 3 sandals. 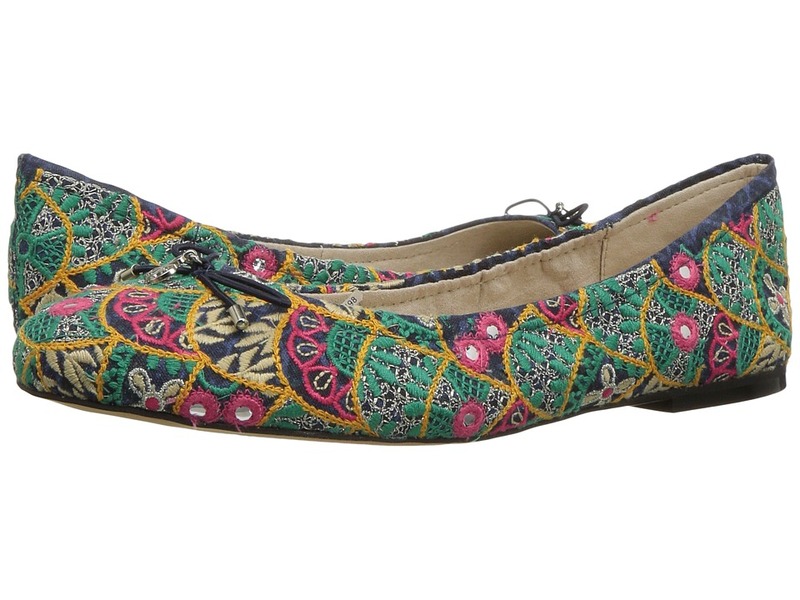 Embroidered textile upper. Ankle-wrap, tie closure. Synthetic lining. Lightly cushioned insole. Synthetic outsole. Imported. Measurements: Heel Height: 1 4 in Weight: 6 oz Product measurements were taken using size 9, width M. Please note that measurements may vary by size. Weight of footwear is based on a single item, not a pair. Give your sassy side an outlet. Lace into luxury with the breezy Sam Edelman Harriet wedge sandal. Suede leather upper. Ghillie lace-up closure. Man-made lining. Lightly cushioned insole. Wrapped wedge heel with jute covered midsole. Man-made outsole. Imported. Measurements: Heel Height: 4 1 2 in Weight: 12 oz Platform Height: 1 1 2 in Product measurements were taken using size 8.5, width M. Please note that measurements may vary by size. Weight of footwear is based on a single item, not a pair. Dominate the urban landscape in these boldly feminine heeled shootie. Interwoven leather upper. Heel strap with adjustable buckle closure. Open-toe, caged silhouette. Man-made lining. Lightly padded footbed. Stacked, block heel. Man-made sole. Imported. Measurements: Heel Height: 3 1 4 in Weight: 11 oz Platform Height: 1 4 in Product measurements were taken using size 7.5, width M. Please note that measurements may vary by size. Weight of footwear is based on a single item, not a pair. 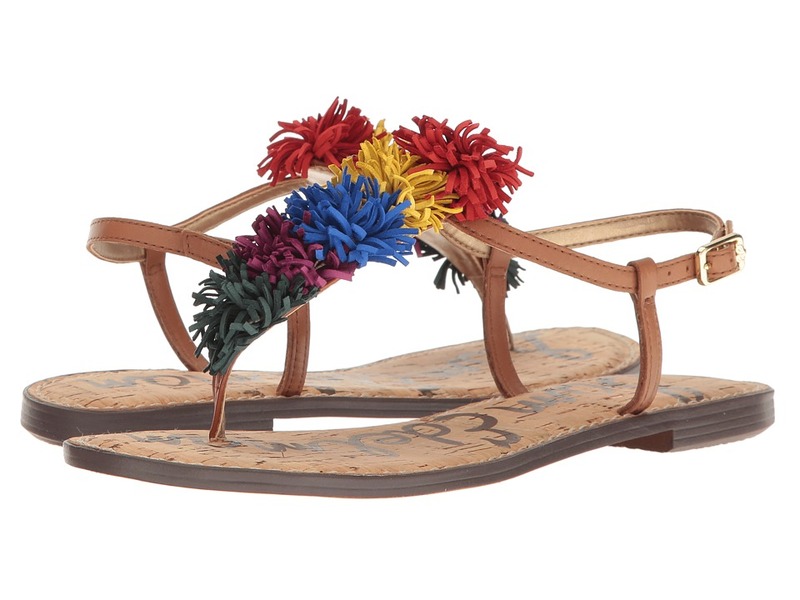 Add a touch of color to your world with the Sam Edelman Karly sandal. Man-made upper with beaded embellishment. Thong construction. Round-toe silhouette. Man-made lining. Lightly padded footbed. Leather sole with man-made heeltap. Imported. Measurements: Heel Height: 1 8 in Weight: 4 oz Product measurements were taken using size 7, width M. Please note that measurements may vary by size. Weight of footwear is based on a single item, not a pair. Give your sassy side a seasonal outlet. Pander to sunny days with the breezy Sam Edelman Luisa sandals. Beaded crisscross textile upper. Ankle-wrap, tie closure. Synthetic lining. Lightly cushioned insole. Low heel. Synthetic outsole. Imported. Measurements: Heel Height: 1 2 in Weight: 7 oz Product measurements were taken using size 9, width M. Please note that measurements may vary by size. Weight of footwear is based on a single item, not a pair. Take it easy with the breezy Sam Edelman Natty platform slide. Crisscross textile or leather upper. Slip-on design. Man-made lining. Lightly cushioned insole. Jute-wrapped platform heel. Man-made outsole. Imported. Measurements: Heel Height: 1 3 4 in Weight: 12 oz Platform Height: 1 1 2 in Product measurements were taken using size 7.5, width M. Please note that measurements may vary by size. Weight of footwear is based on a single item, not a pair. Give your sassy side an outlet. 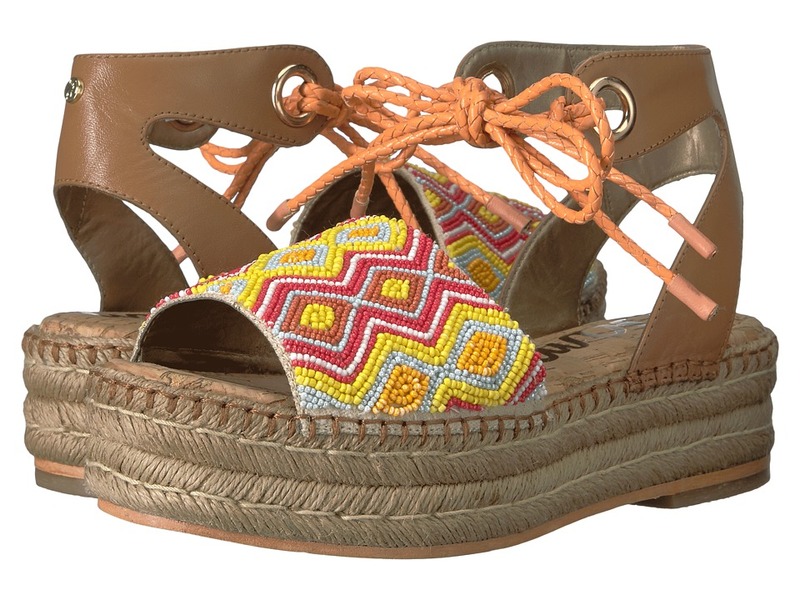 Pander to the party with the breezy Sam Edelman Neera platform espadrille. Beaded textile and leather upper. Ankle-wrap, tie closure. Man-made lining. Lightly cushioned insole. Jute-wrapped platform heel. Man-made outsole. Imported. Measurements: Heel Height: 2 in Weight: 14 oz Platform Height: 1 1 2 in Product measurements were taken using size 8.5, width M. Please note that measurements may vary by size. Weight of footwear is based on a single item, not a pair. Give your sassy side an outlet. Pander to the party with the breezy Sam Edelman Patsy wedge espadrille. Smooth leather upper. Ankle-wrap, tie closure. Man-made lining. Lightly cushioned insole. 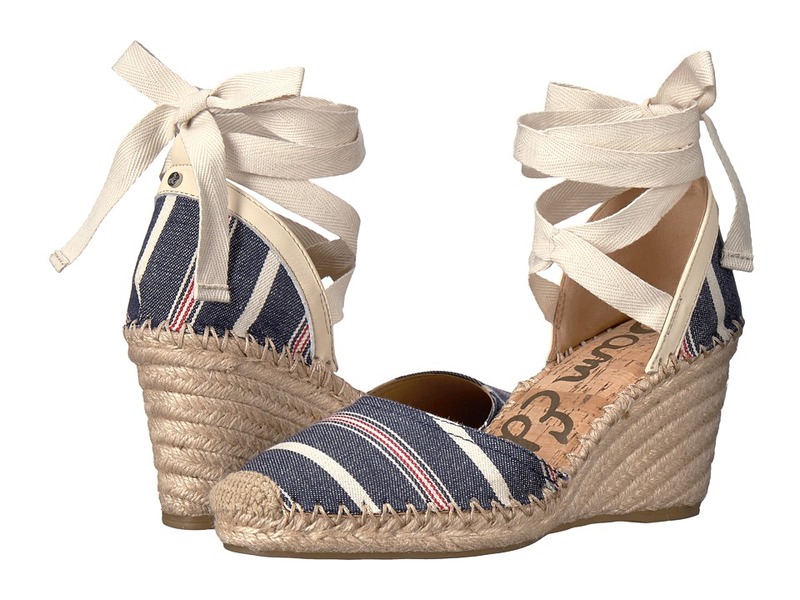 Jute-wrapped wedge heel. Man-made outsole. Imported. Measurements: Heel Height: 3 in Weight: 9 oz Platform Height: 3 4 in Product measurements were taken using size 9, width M. Please note that measurements may vary by size. Weight of footwear is based on a single item, not a pair. Something seductive this way comes. Step into sultry with the alluring Sam Edelman Sheri sandal. Suede upper. Ankle-wrap, tie closure. Man-made lining. Lightly cushioned insole. Chunky blocked heel. Man-made outsole. Imported. Measurements: Heel Height: 2 1 2 in Weight: 10 oz Product measurements were taken using size 9, width M. Please note that measurements may vary by size. Weight of footwear is based on a single item, not a pair. Sunny days are just around the corner. 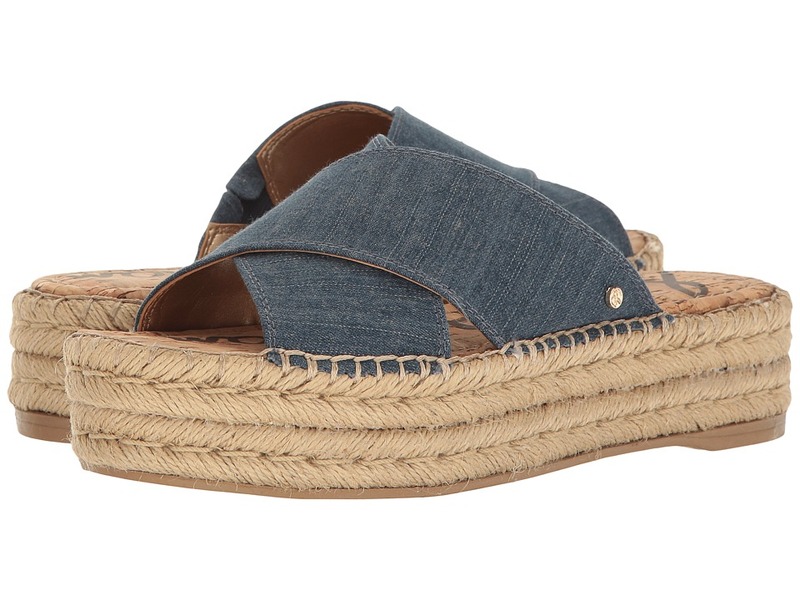 Transition into timeless style with the versatile Sam Edelman Yumi slide. Textile or leather upper depending on colorway. Slip-on design. Man-made lining. Round-toe silhouette with open toe and heel. Feminine bow detail at vamp. Lightly cushioned footbed. Stacked block heel. Man-made outsole. Imported. Measurements: Heel Height: 4 in Weight: 12 oz Product measurements were taken using size 9, width M. Please note that measurements may vary by size. Weight of footwear is based on a single item, not a pair. 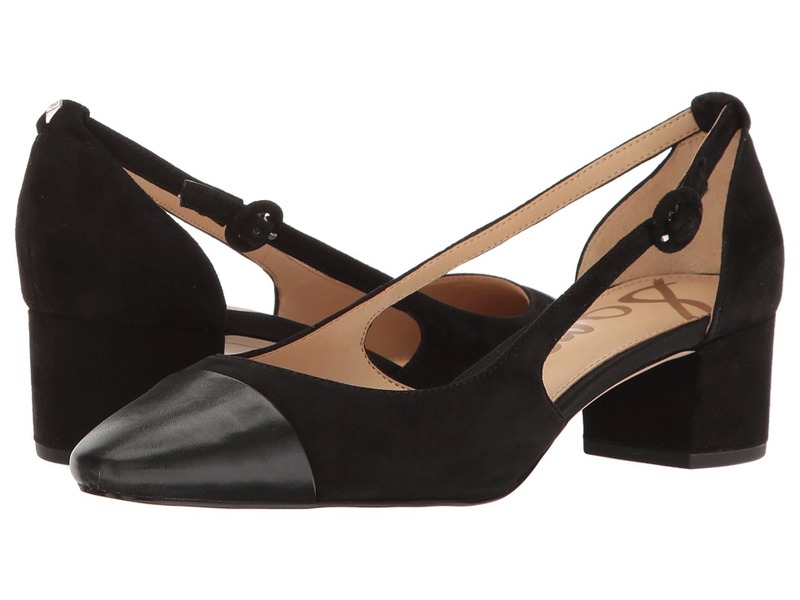 Classic gets an update with the sharply styled Sam Edelman Leah cap-toe pump. Available in a variety of uppers. Adjustable buckle closure. Almond-toe silhouette with side cutouts. Man-made lining and footbed. Wrapped block heel. Man-made sole. Imported. Measurements: Heel Height: 1 3 4 in Weight: 9 oz Product measurements were taken using size 8.5, width M. Please note that measurements may vary by size. Weight of footwear is based on a single item, not a pair.